A few months ago, I went up to North Carolina to drive a stretch of US129 in the Deal’s Gap area. This length of road is approximately 11 miles and includes 318 turns. This is commonly called “Tail of The Dragon”. What a great experience this was to have a few days to spend up in the clear air of the mountains taking in the beauty of everything around me. The last day of the trip I took a day trip up to Banner Elk, NC. to see and old friend from the Marines. On the way back, I decided to stay off the interstate and take the highways to see as much as I possibly could. I could not believe how many churches there were! My friend tells me I was driving through the “Bible belt”. Aside from churches was an abundance of farm houses. This particular picture I took out of the passenger window of my car while I was heading to my buddies house depicts a big field with two such barns. He told me that the symbols on the barns are included in a region wide effort to get tourists to find them all and take pictures of them. 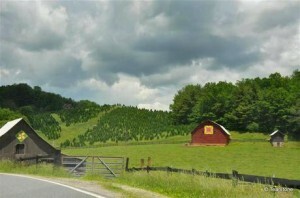 In the background, you will see pointy cone shape trees, those are budding Christmas trees. I understand this area is the leader of growing and selling Christmas trees.